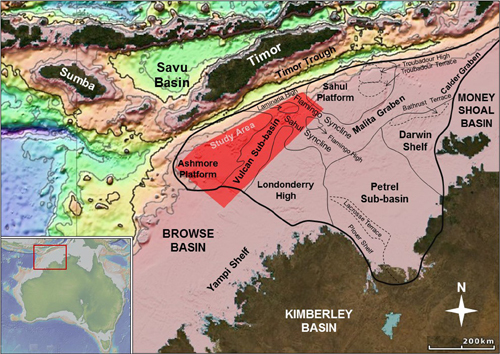 The Bonaparte Basin (North West Shelf of Australia) is a long-lived sedimentary basin containing up to 15 km of Phanerozoic sediments and more than 78 hydrocarbon discoveries. At present, it forms a very wide, shallow-water (less than 200 m deep) continental shelf extending on more than 630 km from the shoreline to the shelf-edge. Neogene deformation primarily controls the depocentres, Quaternary sedimentary pathways across the basin, which is characterized by interplay between siliciclastic material supplied by rivers and carbonate reef growth. This project aims to evaluate Neogene stratigraphic and tectonic evolution of the north-western Bonaparte Basin. A large 3D seismic mega survey (18,000 km2) will be used, making the project distinctive and allowing basin analysis at very high spatial resolution. Seismic data, calibrated with well data (bio- and litho-stratigraphical), will be interpreted in a structural and sequence stratigraphic framework. System tract, seismic facies, external form and internal geometry mapping will be carried out and combined with isochron, isochore and paleogeographic maps. Seismic based Wheelers’ diagrams will be prepared to compare with global chronostratigraphy, eustasy and relative sea-level changes. This project will potentially have both local applications and global contribution to the field of basin analysis and sedimentary geology. Locally, the project has direct implications to hydrocarbon exploration as Neogene to Recent deformation is responsible of major reservoir and seal formation and/or breaching. Chronology of Neogene tectonic events in south-east Asia as recorded on the north-western Bonaparte Basin will be carried out to understand hydrocarbon leakage history in the basin. Active tectonics, eustasy and synchronic sedimentation over wide continental shelf will be addressed, which have global applications for ancient analogues (world’s largest hydrocarbon provinces), to predict: i) deformation mechanisms on large platform in ongoing collision, and; ii) development of carbonate platforms and reefs in relation to reactivation of basement architecture. Further, seismic facies mapping combined with structure maps will potentially reveal possible sites for CO2 sequestration.